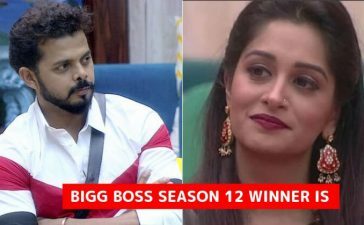 The Bigg Boss season 11 was immensely entertaining. Although the finale is not telecasted on TV we would like to announce that Shilpa Shinde is the Bigg Boss winner. We all knew that Hina Khan, Shilpa Shinde and Vikas Gupta competed in the finale as Puneesh Sharma was already out of the race. After some time, Vikas was got out of the race and it all came down to the two divas (Hina and Shilpa). The show was a completed dose of entertainment. The evicted contestants performed to add an additional kick of entertainment to the grandest finale of all time. Bandagi Kalra and Puneesh Sharma performed on “Tip Tip Barsaa Paani”, they displayed their matchless chemistry. Besides that, Vikas Gupta and Shilpa Shinde performed on the Naagin Song, the song somewhat displayed the exact situation that we saw inside the house. Vikas played the cold and calculated “Sapera” (Snake Charmer) while Shilpa played “Naagin” (Snake). We have seen that Shilpa and Vikas shared similar relation in the first week of this season. Akshay Kumar, Salman Khan, and Dhinchack Pooja performed onstage together and added a slightly comic touch to the show. After the ultimate entertainment, she season ended with the result that pleased everyone. In the end, the duo of “Padman” Akshay Kumar and Salman Khan announced the victor. Shilpa Shinde emerged victoriously. The road to glory was not easy for Shilpa Shinde; she was surrounded by the enemies, right from the first week. However, she managed to survive in the game and she won the hearts and grabbed the first place. The second place went to Hina Khan and Vikas Gupta landed on the third spot. What do you say about the results? Are you happy with the Bigg Boss winner? Share your thoughts in the comments and you can congratulate the victor in the comment box. Also, check the top 10 fights of Bigg Boss 11.